With our marathon walking around Washington yesterday, we slept in a little this morning. Our second day of sightseeing began with a Metro ride to the Pentagon. 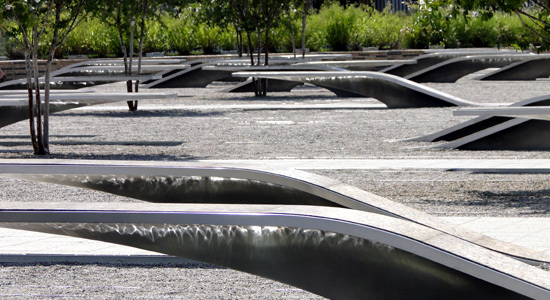 Click here to see my pictures of the Pentagon Memorial. There was a long walk from the Pentagon Metro station to the Pentagon Memorial. We had to walk to the far side of the massive building to reach the memorial. The memorial has 184 benches that are arranged in rows according to the victim's ages. Each bench in has a pool of flowing water underneth is illuminated and is engraved with the name of a victim. The direction of each bench and the name on it indicates the location of the victim at the time of the attack. The names of the victims that were inside the Pentagon are arranged so that the name is read while facing the Pentagon's south facade, where the plane hit. Benches dedicated to victims aboard the plane are arranged so that those reading the engraved name will be facing skyward along the path the plane traveled. There are times when we visit memorial and monuments and don't fully appreciate the events or meaning that the site is commemorating. We get wrapped up in seeing the beautiful design, architecture and landscaping. Today at the Pentagon Memorial there was a man who was crying and being consoled my two ladies. I saw him for just a moment before looking away. I didn't want to stare at him, invade his personal space or disturb him in any way at this very personal moment. The brief moment I saw him brought to me the true importance of the events that took place on these grounds on September 11, 2001. I wanted to lookup the name of Terence M. Lynch who was one of the victims of the attack. Terence was the brother of Ted Lynch, my accounting instructor and advisor at Hocking College. Terence had worked for many years in Washington for the U.S. government. In 1999, Terence left the U.S. government and began work as a military and health care issues expert. On the day of his death, Terence was attending a meeting at the Pentagon to extend military survivor benefits to military families. We were already feeling the midday sun beat down on us and the temperature again reached one hundred degrees. Jenny, Jake and I walked across the freeway and up the hill to the Air Force Memorial, while Crissy, Derek and Sarah stayed behind. 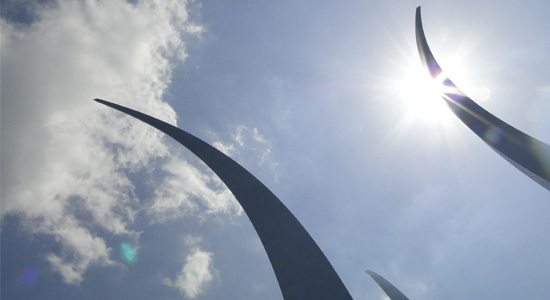 Click here to see all the photos of the Air Force Memorial. The United States Air Force Memorial honors the service of the members of the United States Air Force. The memorial is located on a hill on the grounds of Fort Myer and overlooks the Pentagon. The main feature of the memorial is three stainless steel spires that bring to mind the Air Force Thunderbirds as they peel back in a precision 'bomb burst' maneuver. The highest spire is 270 feet high. The absent of a fourth spire suggests the missing man formation flown during Air Force funerals. I think the spires of the Air Force Memorial are the most beautiful and greatest example of architecture in America in a very long time. The memorial truly gives you the sense of flight and the feeling that the spires are soaring themselves. After the long walk down the hill and back to the Pentagon we met up with the others and headed to the Metro station. One train later we were at L'Enfant Plaza. After a little confusion as to which way was north, we headed to the Smithsonian Institution, National Air and Space Museum. Click here to see my photos of the National Air and Space Museum. At the Air and Space Museum, I was very excited to see the Apollo 11 Command Module, Gemini IV, Mercury "Friendship 7" and the X-15. 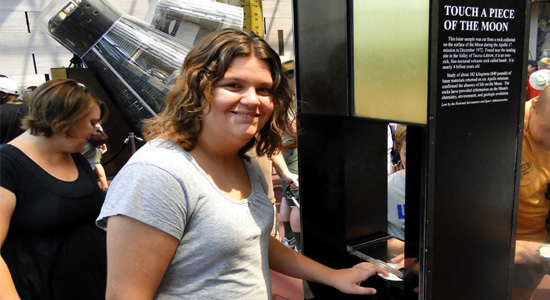 Sarah and I each touched a moon rock. There were countless spacecraft and aircraft on display. There was just so mush to see and do and not enough time to take it all in. The crowds of boy scouts made it hard to even walk around. We watched and IMAX 3D film while we were at the museum. It was "Hubble 3D" narrated by Leonardo DiCaprio. The movie was awe-inspiring with it's high resolution images and 3D travels through space. It really gave me a great sense of the huge scale of the universe. The film was moving. It even brought tears to my eyes. All of us were very impressed with this film presentation. After another train ride on the Metro we arrived at the McPherson Square station and then we were walking south to the White House. 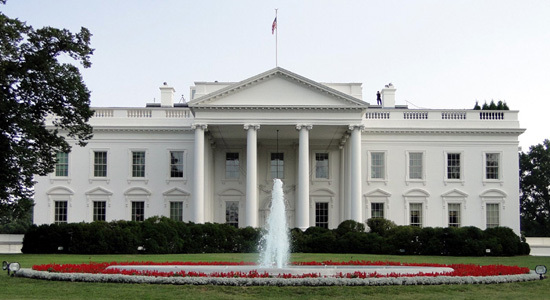 Click here to check out my pictures of the White House. We walked south through Lafayette Square to the White House. Between Lafayette Square and the north side of the White House is Pennsylvania Avenue, which is now closed to traffic. There were some groups of protesters in the area, but they were far outnumbered by the boy scouts. We spent a fair amount of time taking pictures and checking out the Secret Service. Crissy, Derek, Jake and Sarah headed back to the Metro station for the trip back to the Hotel where they planned to relax and cool off in the pool. Jenny and I continued on with our sightseeing mission. We headed around the west side of the White House and the Eisenhower Executive Office Buildings to get to the south side of the executive mansion. Was I walked past one of the large metal poles that act as a barrier to keep traffic off Pennsylvania Avenue. I heard a large bang just behind me and I jumped into the air. I turned around to see what was happening. Approaching us was a Secret Service police cruiser. The officers inside the car were laughing. And so was Jenny. Apparently, they had just used a remote control to lower the metal barricade in the roadway. I guess it's good to know that the Secret Service has a sense of humor. We circled around to the south side of the White House for more pictures. Next we were off for the long walk to the Vietnam Veterans Memorial. Click here to see all my photos of the Vietnam Veterans Memorial. The Vietnam Veterans Memorial is unlike any other memorial in Washington. 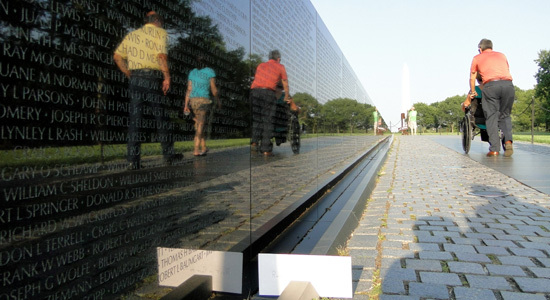 The memorial is a simple and elegant design of the black granite wall engraved with over fifty-eight thousand names. No speeches. No political statements. It is a straightforward remembrance of those who have died. I was interested in finding the name of James C. Whitmore. He was an Army Private from Elyria, Ohio. He was born one month after my dad and was killed in Vietnam nine months before I was born. We also visited the "The Three Soldiers" and "Women's Memorial" that are also part of the Vietnam Veterans Memorial. Next, we made our way south past the Lincoln Memorial to the Korean War Memorial. Click here to check out my pictures of the Korean War Veterans Memorial. 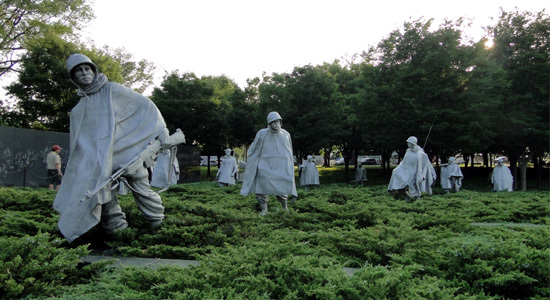 Nineteen stainless steel sculptures are the centerpiece of the Korean War Veterans Memorial. A granite wall, a reflecting pool and walkway complete the site. The afternoon sun was getting lower in the sky. Once Jenny and I told our last pictures for the day, we headed north to the Metro station at George Washington University for the ride back to the hotel. The temperatures hit one hundred degrees today and we all did a lot of walking. It was time for us all to cleanup, relax and recharge. Today is Derek's birthday and to celebrate we decided to dinner together. Once we returned to the hotel, we all showered and headed down to the hotel's restaurant. I had a salad including peal and eat shrimp, a fantastic steak with au jus, baked potato and a margarita. Each item I had was so full of flavor. The steak was juicy and the potato was extra buttery. Usually I don't care too much for au jus or cocktail sauce that has a lot of horseradish, but I forced myself to try each this evening. I enjoyed them both. This was also the first time I have had a margarita. I really took pleasure in variety of all the flavors. Each of us enjoyed our dinner. Happy Birthday Derek! Tomorrow we are going to the National Zoo before heading home.